Inspired by the fabulous Promtacular! which I discovered just yesterday, I have a little something to share with you. It is Prom season after all. How about a walk down memory lane? That's me in the red dress that is perhaps 2 sizes too big for me. And yes, yes those are suntan pantyhose several shades darker than my actual skin. How nice of you to notice. What this picture ISN'T communicating is that the dress was brocade so that made it a little tough to get the shoes dyed-to-match. But, don't worry, I got the job done. 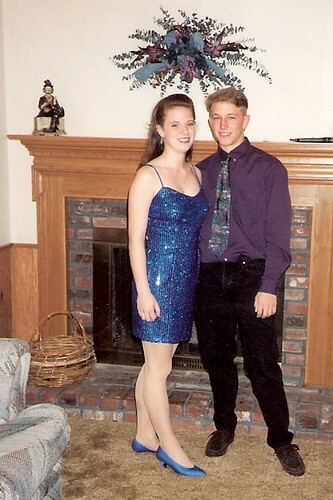 And because, Homecoming was a tad flashier... get a load of this. It's true. I'm wearing an electric blue sequins dress. Truth be told, I kind of still wish I had it...the dyed-to-match pumps MUST go however. (hangs head in shame) Oh, and I promise I would wear a bra if I ever put it on again. One bright spot, at least this time I found a shade of pantyhose closer to my pasty white skin tone. Episode 48: "Today I am thankful for... fashion memories." I love that I can look back and laugh at high school and more specifically at what I wore. Because I am secure in the knowledge that I NEVER have to go back nor do I ever have to wear suntan pantyhose again (God willing). Alright, now it's your turn. What did you wear to Prom?? *In case you're wondering, my date to Prom was the same guy who took me to Homecoming. However, due to my irrational FEAR of his wife I am hesitant to post 2 pictures of us on the internet lest I provoke her wrath. i actually wore a silve sparkly full length dress with flip flops i covered in tin foil...i don't remember the reasoning behind it...but there are pictures SHAMEFUL pictures. 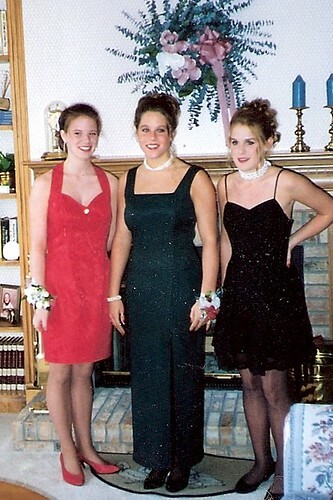 Oh, and once i wore a short black dress with black tights and red high top converse, i think i had shoe issues. I wore a very princess-y purple flowing dress that I think is crumpled up in the closet now. I felt like a princess! And I not only had shoes dyed to match, I had roses dyed to match! Match that!